Gina Apostol is the PEN Open Book Award–winning author of Gun Dealers’ Daughter, as well as a two-time winner of the National Book Award in the Philippines for her novels Bibliolepsy and The Revolution According to Raymundo Mata. Her short stories have appeared in various anthologies and journals including The Gettysburg Review and the Penguin anthology of Asian American fiction, Charlie Chan is Dead, Volume 2. "A bravura performance in which war becomes farce, history becomes burlesque . . . Apostol is a magician with language (think Borges, think Nabokov) who can swing from slang and mockery to the stodgy argot of critical theory. She puns with gusto, potently and unabashedly, until one begins reading double meanings, allusions and ulterior motives into everything." "Apostol is no mystifier or arid avant-gardiste. Rather, she's playful like Italo Calvino or Kurt Vonnegut. She dishes up funny riffs on everything from the 'Thrilla in Manila' and her countrymen's love of Elvis Presley to what the book terms the Filipino Chekhov Rule: If you mention karaoke in the first chapter, somebody has to sing it in the last one . . . It's Insurrecto's great achievement that it confronts us with dreadful things without ever turning into an accusatory, anti-American screed. See, Apostol is after more than recrimination. Steeped in the love-hate relationship with American culture she shares with most Filipinos, she actually seeks to transcend the gap between the two countries." "Stunning . . . An arresting novel with a timely political message, Apostol’s Insurrecto dazzles with its inventive structure and superb portrayals of women as leaders of ingenuity, creativity and reason." "Wickedly funny . . . Ferocious in its political indignation . . . Pick one of the many figures offered by the novel itself: a palimpsest, a translation, a stereoscope, an abaca weave. Insurrecto is all of these things—a polyphonic work that challenges the reader to keep up with its plotting and to think with or against or through its complex moral reckonings." "A risk-taking, cinematic look at Duterte’s Philippines and the 1901 Balangiga massacre during the Philippine-American war . . . Apostol uses techniques from Jorge Luis Borges and Julio Cortázar, expecting the reader to trust her as the story hopscotches through time and space. But for readers accustomed to the jump-cuts and montages of cinema, Insurrecto doesn’t present a challenge so much as a cascade of pleasures and possibilities." “Gina Apostol—a smart writer, a sharp critic, a keen intellectual—takes on the vexed relationship between the Philippines and the United States, pivoting on that relationship’s bloody origins. Insurrecto is meta-fictional, meta-cinematic, even meta-meta, plunging us into the vortex of memory, history, and war where we can feel what it means to be forgotten, and what it takes to be remembered." "Dazzling . . . A tender character study erupting with blazing insights on the ethics of storytelling." "Apostol is preoccupied by the ways that history is mediated—and inevitably distorted—by artists and journalists, whether through photography, films or books . . . Brain candy for the theory-minded." "An ambitious, cheeky, at times savagely brilliant, tour de force." "[A] sobering but humorous funhouse mirror . . . Elegant, wry, and brilliant." "Gina Apostol's novel combines pop culture references, fake movie scripts, road trip tropes, and character studies all in the effort of reexamining the United States' influence on the Philippines—and it works, man." "It is novels like this that make me want to get down on my knees and weep with joy over the fact that such powerful, inventive fiction still exists . . . The narrative structure and writing of the novel are a continuous, beautiful punch in the gut. I loved, loved, loved this book. " "A book by Gina Apostol is always an event, and this latest one is no exception. Lush and vigorous, Insurrecto mines the Philippines' troubled past with a scholar's careful attention to detail and examines the enduring riddles of voice and identity, revolution and nation. The ghosts of history stalk the pages of this dizzying, stunning novel, their footsteps echoing in our fraught and uncertain times." "Apostol fearlessly probes the long shadow of forgotten American imperialism in the Philippines in her ingenious novel of competing filmmakers . . . Layers of narrative, pop culture references, and blurring of history and fiction make for a profound and unforgettable journey into the past and present of the Philippines." "Shrewd . . . inventive . . . stinging . . . [Apostol] puts the "unremembered" Philippine-American War on display, deftly exposing a complicated colonial legacy through the unlikely relationship between a U.S.-educated Filipino translator and a visiting American filmmaker . . . Exceptionally rewarding." "Dazzling, interlocking narratives on history, truth, and storytelling." "Insurrecto is an intricate fever dream of a novel. Gina Apostol’s sublime intellect, razor-sharp humor, and fierce moral conviction shine a powerful light on the Philippines’ violent history and present-day traumas. Through wildly inventive prose and richly layered plots, this book will provoke, unsettle, and ultimately transform the ways we read and remember the past." 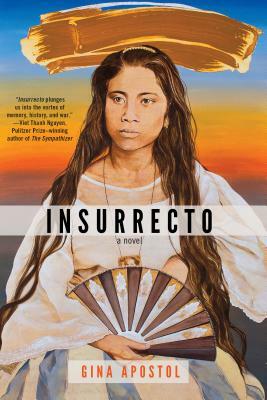 "A mesmeric pastiche, a cleverly hilarious indictment, a vicious, unapologetic tour-de-force: Gina Apostol’s Insurrecto is an astonishing literary masterpiece." "Brilliant . . . [A] heady mix of highbrow and lowbrow references and Vonnegut-like humor." "A fast, deceptively light read, with pop culture, literary, and film references that are sharp and funny. Yet, each reference contains layers of meaning and irony that become increasingly perceptible . . . Read it on a sunny day at the beach, but don’t be surprised if it enters your dreams. Insurrecto floats like a butterfly—but stings." "Apostol’s sharply drawn scenes and characters make a literary masterpiece that is at turns hilarious and heartbreaking, and always compulsively readable."